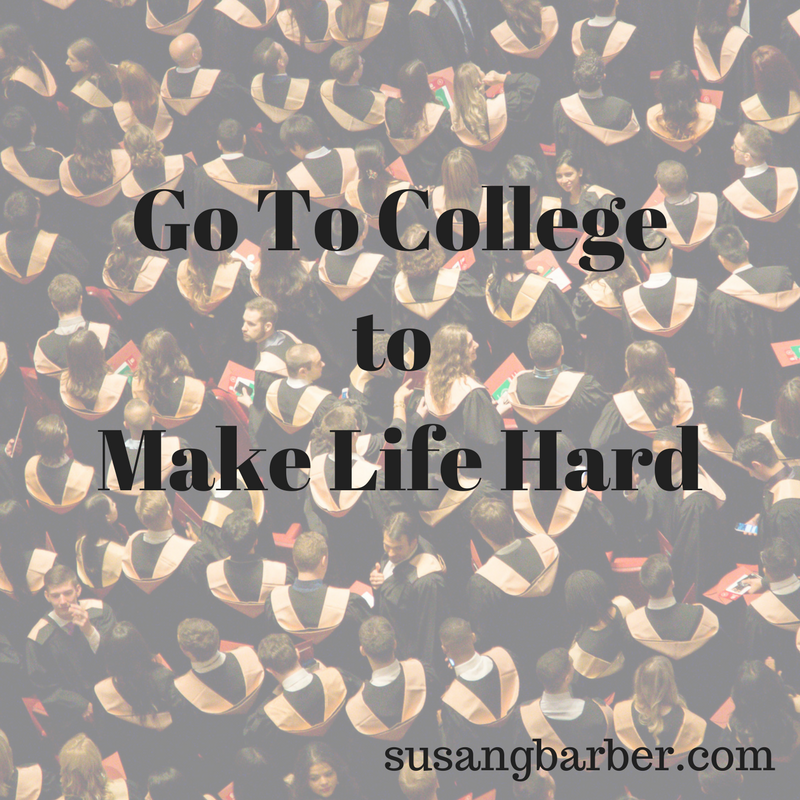 On a recent college tour with the baby of the family, I thought it might be a good time to probe a little to see if the high school junior had any clarity on what she wants to do with her life. Me: So have you thought any more about what you might want to do after college? Baby Barber: I want to marry a pilot and travel the world. Me: There’s no degree for that. Have you thought about what you might study in college? BB: No. What’s an easy job where I can make a lot of money but still have time to travel the world with my pilot husband? Oh, and I want to stay home with my kids, so I’ll be taking a few years off work. I guess I’ll need something that’s easy to go back to after years off and still make a lot of money. Me: Hmmmm – let me think on that. I’ve been thinking a lot about college and college students lately. Maybe it’s because I spend my days around students who are moving from high school to college. Maybe it’s because my baby is about to start her senior year. Maybe it’s because I want to go back to college. Enter Mississippi State (Hail State) professor Brian Shoup who teaches political science and public administration. Professor Shoup spoke at the general assembly for prospective students and said, “You don’t go to college to make life easy; you go to college to make life hard. Do hard work in life.” He continued challenging students by asking, “Are you going to be someone who life happens to them or are you going to be someone who makes life happen for them?” Sign me up for his political science class; I love this kind of talk and was busy making notes on my phone while he was speaking. (Interestingly, the prospective students didn’t like him as much as the parents). I am amazed by countries who have coming of age ceremonies and what some young people have to endure to be viewed as adults in their society. In the Amazon, Brazilian boys must wear gloves filled with angered bullet ants (because a non-angered bullet ant isn’t bad enough) for 20 minutes. This is repeated several times over a few months, and the boys do not cry out because that would demonstrate weakness. In parts of Kenya, male teens drink a mixture of alcohol, cow blood, and milk and are circumcised; again, they do not flinch because this would dishonor their families. Land diving and jumping over cows naked are rites of passage in other countries leaving me thankful to be an American. Are we as parents selling our kids short in their process of becoming an adult because we have made life and the transition to adulthood too easy for them? For many (not all and I know that your kid is the exception), college has become a four year (or five or six) party with little or no responsibility placed on the student rather than a rite of passage to adulthood. Colleges often get the blame that they are not preparing students for the workplace, but the blame doesn’t rest completely with them. Parents must accept some of this responsibility. How can we as parents prepare our kids to do hard work in life? Consider a rite of passage ceremony for your child. I know a family who creates a series of difficult physical and mental tasks for their children to complete before leaving for college. The desire is to stretch the child and build in him or her a sense of accomplishment. Do hard things yourself. If my husband is laying on the couch eating chips and watching Netflix all of the time, my children will be more inclined to do this as well. (I’m busy cleaning house just in case you’re wondering what I’m doing). Give your child responsibility. A child will never be responsible if he or she is not given the chance. Of course, it’s easier to do a job yourself or to not require your child to work because you don’t like to listen to them complain about it, but then they don’t responsibility. Allow your child to fail. Many parents shelter their students from failure in order to give them a good childhood and build the perfect college resume. The problem is we are not growing healthy adults in the process. Allowing a kid to fail and helping them work through the failure takes more time now but less time later. Stress the importance of post-high school experiences. Whether going to college, the military, or straight to work, the years from 18 – 22 should be ones where students grow up and not stall out. The goal is to maximize these years in order to become adults functioning and working in society. Children should rely less and less on their parents in all areas during this time; don’t rob them of these areas for growth. I’m all about kids having a good time in college; I certainly did (that’s a post that will never be written). However, let’s not neglect preparing our students for hard work. Now back to the future pilot son-in-law. Will I get flying benefits?? ← Are You Stuck in Life?